The FIFA Statutes and the accompanying regulations governing their implementation form the Constitution of football's international governing body. I was just going through the FIFA Statutes, while debating why Britain should really get a unified team to have any real chance of regaining the World Cup (which they won't do: their loss!). they get to appoint 4 of the 8 members of IFAB, the institution that makes (and changes) the rules. So basically no rule can be changed without British approval! they get to appoint one of the 8 vice-presidents on the Executive Committee, at the same level as UEFA, CONMEBOL etc. So they are basically considered at the same level of the biggest football organisations when there's anything to be decided. This said, they are hopeless at diplomacy, pretty much like Italy, with the result that for decades UEFA has been dominated by a French/German/northern countries block, and FIFA by south-American alliances with marginal federations. Alan Moore for Wizard of England! The Prime Minister recognises the achievements of Alan Moore and the widespread regard in which he is held. [...]but frankly I'm not interested unless they make him Official Wizard of England. Now that would be an honour. An MBE, on the other hand doesn't seem the sort of thing that Alan needs. He'd just put it down somewhere and it would wind up under the sofa. But if they made him Official Wizard he would wear a hat. 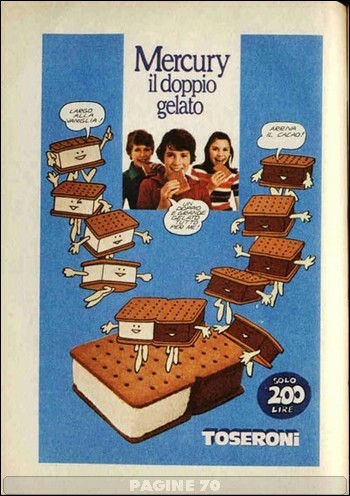 Italian Football Folklore: "il biscotto"
The "Biscotto" (literally "biscuit") is a central concept in Italian football. It's a sum of Italian attitudes towards football institutions, honesty, fair play, and "dietrologia" (another very Italian concept, "the study of what might be hidden" -- from "dietro", behind). This term comes from an ice-cream brand, as you would expect from such a food-obsessed culture; specifically, an ice-cream surrounded by two biscuits. The biscuits don't touch each other, but squeeze a dollop of ice-cream between them -- exactly like two contenders who won't hit each other, but will manage to squeeze out a third party standing in their way. For example, imagine that two teams have to play a match in a tournament, and there is only one possible result that will qualify both of them to the next phase of the competition and eliminate a third party. They could come to an agreement to make sure the "right" result comes out; this would be a classic "biscotto". Or imagine that two teams have to play at the end of the season, and one club doesn't really have anything to play for, while the other needs points to avoid being relegated (hence pushing down another team)... you get the idea. It's basically a combine where a third-party gets hurt. The Italian football team was (or it was perceived as being) on the wrong side of an alleged "biscotto" a few times in recent history, most infamously at Euro 2004 when Denmark and Sweden produced a 2-2 draw which qualified both Scandinavian nations and kicked out the "Azzurri". If you then consider the 2002 incident (when South-Korean hosts kicked out Italy in a match plagued by a terrible referee), and a penalty awarded in the first minutes of the 2006 World Cup final (on a dive by French player Malouda), you can understand why the Italian press is currently running wild with speculation of an upcoming "biscotto" between Romania and the Netherlands. The Oranje are already mathematically certain to win their group, whereas Romania needs a victory to stay in second place and kick out France and Italy... which is a result Holland might like, considering as these two (currently troubled) teams usually transform into tough competitors for the final stages of major tournaments. The Italian people experienced a long history of political intrigue, stretching all the way back to Imperial Rome; we tend to see daggers hidden in every dark corner, conspiracies arranged for the most worthless situations, puppeteers pulling strings in the smallest of everyday occasions. For centuries our political landscape was defined elsewhere, with Italian city-states acting as proxies for various European powers, all the way up to the Cold War. As a result, we tend to be a little too suspicious, and assign responsibilities to others that should really be ours. If we really wanted to qualify, we should have won (or drawn) against the Netherlands, and won fair and square against Romania. Instead, our men played badly (especially in the first game), and our "lethal" strikers couldn't score even given massive amounts of chances (a defender had to step up and do it). They shouldn't have put themselves in that position in the first place. Once you get to depend on the whims of somebody who doesn't owe you anything, you can't complain about what might happen. Life is tough. Just a quick note to point any UK-based reader to the last campaign from The Co-Operative Bank: you can vote for a human-rights charity that will get money from the bank. The program is developed with Amnesty International, so all charities are very worthy; my vote this year went to The Medical Foundation for the Care of Victims of Torture, quite a topical subject in times of televised indoctrination on the "benefits of torturing people" (oh yes, I hate 24). There are only a few charities worldwide that do this sort of work (as far as I know, the other one is in Denmark). I'm going back to the old habit of uploading "beta" builds of KDelicious a few days before releasing. I had a lot of problems with Debian packages after I stopped doing that (for completely unrelated reasons), so I thought I'd summon a bit of old-times' luck... The files are in a little corner of the web. If you try them, please report any problems to me (g dot lacava on Gmail) or on the bugtracker at kdelicious.sf.net. I've just uploaded "the KDelicious Handbook", that is the documentation for all old (and new) KDelicious features. This was the first time I used docbook to generate this sort of files, but I thought that it would have been nice to follow KDE guidelines, after all it's a KDE add-on! Advantages of docbook: you write the docs once, then you can have as many stylesheets you want and get consistent output for different media. Using the KDE xsl files, it's really a snap. Disadvantages: you have to write lots of markup, which can be painful; Emacs' SGML mode can help a bit there. Translation processes must be terrible, you have to re-write pretty much everything as there's no easy gettext-like method to keep style and content separated. I've also written a small shell script to repeat the process, as I know tomorrow I'll forget everything I've learnt about meinproc and where the xsl templates are (/usr/share/apps/ksgmltools2/customization). The script also appends the Sourceforge logo to all pages meant for the web, as it's required by the SF policy (thanks to the wonders of sed). And of course it's all been put under version control. Am I "Pragmatic" or what? Early pythons get the bird -- book PyConUK now! I just reserved my place at PyCon UK 2008, which will again be held at the Birmingham Conservatoire on the second weekend of September (12/13/14). If you like Python and you can make it, you should: the vibe last year was great, the talks interesting, and the organisers a nice bunch of geeks. The extra-early-bird offer expires on June 9, so be quick and you could save a few pounds! If you come, take a minute to RSVP on the official PyConUK 2008 Facebook event page; the more people there, the better visibility (and credibility) we get. Also, if you are on other social networks, you can do something similar to aggregate interested people. Unfortunately I can't make the Friday tutorials (I'm saving days for a big trip to Japan in October), but I'm sure Saturday and Sunday won't be disappointing. See you there! Scenario: you have two competing products. One is fully developed "in the open" (online Trac, open mailing lists, etc); the other is 100% closed (main bugtracker/dev lists are "behind the firewall", no public nightly builds, etc). What does it happen when you introduce a new feature? In the closed case, nobody will know. You can plan a big Steve-Jobs-like demo, or disseminate distracting rumours (and send competitors up the hills); as long as you can avoid leaks, you are in control. With an "open" project, in a few minutes the word will be out. You can hide things in a wiki or a bugtracker, but version control checkins will "fess up" pretty fast (you could deliberately put in blank or disguised comments, but that would irremediably pollute your repository). Competitors will start efforts to match the feature, and your competitive advantage might be gone even before you had time to exploit it. The element of surprise, with an open project, is not available. This might or might not be a big deal. Personally, I'm finding it a bit of a nuisance, since I have a couple of new features in the pipeline for my little apps which, I hope, will be seen as fairly innovative for this sort of tools.